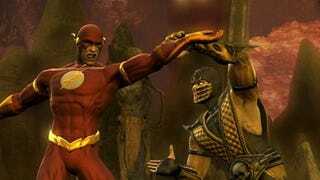 If you're a PlayStation The Official Magazine subscriber, you already know that Flash will be joining the Mortal Kombat vs. DC Universe roster, along with an impressively chesty Sonya Blade. If not, well, there you go. The speedy champion of Central City is going to rep the DC side in Midway's upcoming brawler, bringing the confirmed list of DC heroes to three. How many others from the DC stable will appear? Boon clears up a slew of misconceptions in a new Q&A with GameSpot, noting that DC villains will come equipped with the series trademark Fatalities, but that the good guys will just beat each other into a pulp. The PG-13-ing of Mortal Kombat somehow manages to break a little bit of my heart. Which will go on, by the way.